A teardrop-shaped created ruby is complemented by two sparkling diamonds in this lovely pair of 9ct yellow gold earrings. 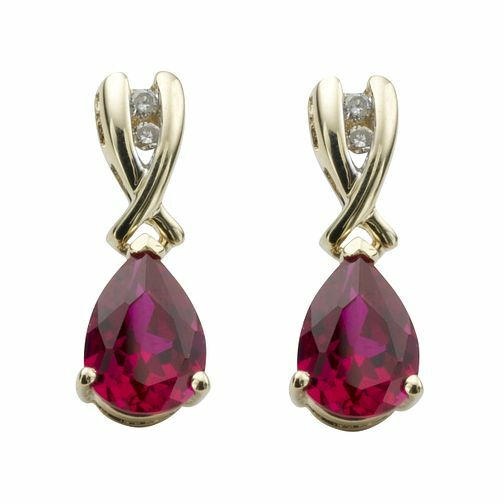 9ct gold created ruby and diamond drop earrings is rated 5.0 out of 5 by 2. Rated 5 out of 5 by Anonymous from Great quality product and great supplier I purchased these online with a click and collect service, having been an Ernest Jones customer for many years and once again, was not disappointed. Rated 5 out of 5 by Anonymous from Elegant earrings Absolutely delighted with these earrings. They hang beautifully and have a clear deep colour. Perfect match for my ring and bracelet, would love it if there was a matching pendant.